America finally has a new dorm-room dining hot spot to replace Pith, the insanely popular pop-up that 21-year-old Columbia University student Jonah Reider rode to a Colbert appearance and Chicago restaurant job last year. This new “restaurant” has been operating out of a Boston University dorm, and the fare is sushi. The New York Post reports that roommates Jarrett Deutsch and Ethan Cole spent last semester sprucing up their tiny living quarters (this seems to have involved installing color-changing lights and draping sheets on the beds, which is where guests sit), and charging up to $35 a person for a ten-course nigiri tasting menu. The duo — both 19-year-old Manhattan natives who weren’t fans of the campus’s “humdrum” dining options — says the restaurant happened by accident. “My dad was getting pissed that I was spending a couple thousand every month on food,” Deutsch admits. He was forced to start cooking some of his own meals; experiments with a Crock-Pot led him and Cole to branch out into sushi, which Cole had learned to prepare from his dad. 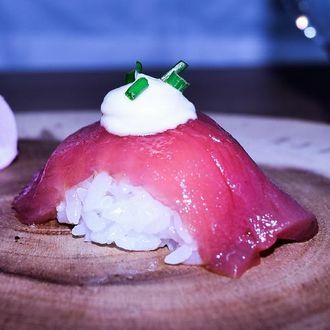 One day, they made too much, and “frat kids started buying the extras.” Naturally, this inspired them to launch a full-blown Japanese-Italian-French-fusion omakase restaurant in their dorm room. It’s called the 803 (their room’s number), and at their busiest this past spring, they were apparently doing as many as 32 covers a night. If your interest is now piqued for the August pop-up, be prepared to throw down some moola: It’s $45 to $60 for lunch, and $100 to $130 for dinner.